The Tatuaje Drac is a part of Tatuaje’s Pudgy Monsters Series that was released in mid 2014. For the past few weeks we have been looking at the various cigars that are a part of this sampler. Pudgy Monsters is the second sampler series based on Tatuaje’s Monsters Series – a line released on an annual basis that pays homage to a different monster / horror movie character. In 2012, the Tatuaje Little Monsters would be the first sampler series released – providing smaller and thinner versions of the original Monster Series releases. While there are two all new blends in the new Pudgy Monsters Series with the Tatuaje Chuck and Tatuaje Tiff; the remainder of the set provides another set of smaller monsters. With these other Pudgy Monster cigars, for the most part they will have the same ring gauge as the original Monsters and same length as the Little Monsters. 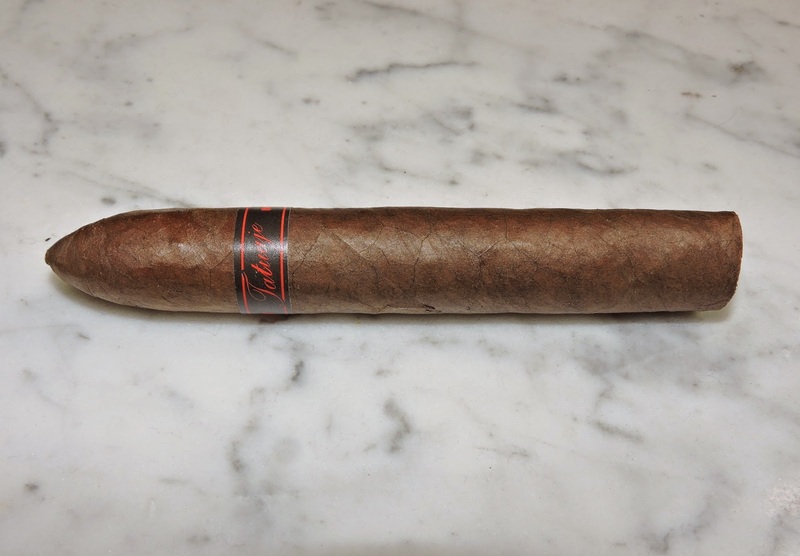 Today, we take a look at the Tatuaje Drac – which is a shorter version of the 2009’s Tatuaje – The Drac and a thicker version of the Little Monsters’ Tatuaje Lil’ Drac. I recently had an opportunity to smoke this cigar. The Pudgy Monsters sampler has scored very nicely on Cigar Coop, and the Pudgy Monsters Drac is no exception. The Pudgy Monsters series consists of 10 cigars. There is one cigar per blend that has previously been released in the Monsters series. The new blends, Chuck and Tiff contain two cigars. 2014’s Tatuaje Jekyll is not a part of the Pudgy Monsters release. The Pudgy Monsters Drac uses the same blend as the original Tatuaje – The Drac. As with just about all Tatuaje Cigars these are made by the Garcia family of My Father Cigars. Until the release of Tatuaje Chuck, the Drac bland was the only one to feature an Ecuadorian Habano wrapper. For completeness we include all of the vitolas with The Drac blend. As we noted above, the Pudgy Monsters Drac has the same length as the Lil’ Drac and same ring gauge as The Drac. The Habano Ecuadorian Maduro wrapper is pretty consistent with the other vitolas of the Drac blends. I considered it to be somewhat lighter than most maduros, but resembling almost a dark colored wood. The Pudgy Monsters Drac has an oily sheen to it. There are some thin veins and the wrapper seams are quite well hidden. The band is based on the standard “Tatuaje” scripted logo. The script font is red on a black background. To the left of the “Tatuaje” scripting is the text “PUDGY” in red font. To the right of the scripting” it says “MONSTERS” in red font. As with the case of the Lil’ Drac, the placement of the band on the Pudgy Monsters Drac is below the torpedo tip. On the original Drac, the band was placed upside down by the foot of the cigar. The purpose of this was to make the Drac seem like the Dracula fang. The start to the Pudgy Monster Drac delivered some notes of white pepper, grass, and chocolate. There was some more pepper on the onset of the Drac before it dialed back. As the flavor profile emerged, the primary notes became a mix of earth and orange peel. The white pepper notes were a close secondary note. The grass notes were more distant and these notes were accompanied by some subtle chocolate notes. Meanwhile while I detected white pepper on the tongue, I detected more of a black pepper on the retro-hale. During the second third the earth notes remained primary while the chocolate note floated in and out between the forefront and background. The pepper notes remained close behind and combining with the orange peel notes, it delivered a twang. Meanwhile the grass notes remained more distant. For the last third, the earth notes remained in the forefront. The pepper notes were now in the forefront. The twang still remained prominent. The grass notes remained in the background and the chocolate notes had dissipated. There was a little bit of harshness at the end of the Pudgy Monster Drac. This is the way the flavor profile held until the end. The resulting nub was soft to the touch and cool in temperature. This is the seventh of the eight Tatuaje Pudgy Monster blends to be assessed (only the Pudgy Monster Frank is yet to be assessed) and in each installment we have smoked, the burn and draw have scored quite well. The Pudgy Monster Drac is no exception. I found the burn line to be relatively straight from start to finish requiring some occasional touch-ups along the way. The resulting ash had a charcoal gray color. Except for some slight flowering early on, the ash remained firm throughout the smoking experience. The ash came off the cigar in nice clean chunks. The burn rate and burn temperature were ideal. While I still would have preferred a parejo, I was quite pleased with the way the draw performed on this torpedo. The draw was not too tight and not too loose. 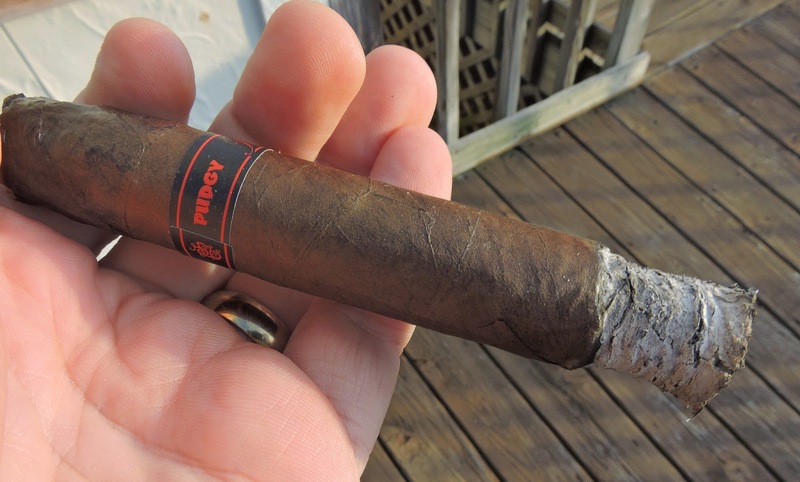 The tip did not get soft and mushy as you smoked the Pudgy Monster Drac – which is something that I think is a big plus on a torpedo. This made for an enjoyable smoking experience from start to finish. From a strength and body perspective, I found the Pudgy Drac to be similar to the Lil’ Drac. This is a cigar that delivered a medium to full experience in terms of strength and body from start to finish. While the Lil’ Drac was also medium to full-bodied, I might give the Pudgy Drac a slight edge. In terms of strength versus body, I found the two attributes to balance each other nicely – with maybe a slight edge going to the body. When I first smoked the Lil’ Drac from the Little Monsters Series, I commented how this was a different maduro. In fact, I even made the comment this might be a cigar for someone who does like Dominican tobacco. This wasn’t to imply that the Lil’ Drac smokes like a Dominican cigar (in fact it has many classic Nicaraguan qualities), but I can easily see putting this cigar in someone’s hand who likes Dominican. That being said, the Pudgy Drac probably falls into a similar category. As for the cigar itself, it’s one of those cigars that I put into the category where it delivers a solid smoke. It won’t be mind-blowing, but it won’t disappoint you either. I might give a slight edge to the Lil’ Drac. Given that the Lil’ Drac aged nicely, I do believe similar potential is there for the Pudgy Monster Drac. This is a cigar I’d recommend to an experienced cigar enthusiast or a novice looking to graduate to something in the medium plus range. As for myself, this was a nice cigar and it’s one worth a five pack of this blend.